Danny O’Brien is following the same path and he hopes it can deliver the same result as he eyes back-to-back Geelong Cups on Wednesday. O’Brien used his Barwon Heads training complex to perfection when he won the race last year with Caravan Rolls On and he has done the same thing with De Little Engine heading into the race. But O’Brien faces a tougher challenge this year with a full field of 17 runners heading to the barriers after final acceptances were taken yesterday. It’s the biggest field since 2009 and features four high-class international stayers — Quest For More, Guardini, Bonfire and Dandino — at the top of the weights. The five-year-old gelding has thrived on Thirteenth Beach and O’Brien is confident De Little Engine will run well on Wednesday. “We think that when horses are up and about that Barwon Heads is the best spot for them,” O’Brien said. “We have a beautiful grass track there and right on Thirteenth Beach. Everything is right at our finger tips. O’Brien said the preparation of De Little Engine was “very similar” to that he used with Caravan Rolls On. “Caravan Rolls On was third-up into the Geelong Cup and it’s the same with De Little Engine,” he said. Damien Oliver returns to ride De Little Engine at Geelong with the pair drawn in barrier 13. “He’s got a bit of a sticky draw. I’ll leave it to Damien (what we do),” O’Brien said. 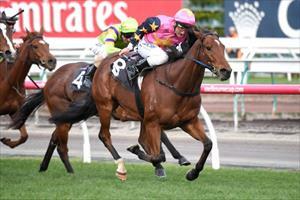 De Little Engine galloped at Geelong on Saturday morning with 2014 VRC Derby runner-up Bondeiger over 2000m. O’Brien was impressed with his work. “He has been given every chance. They both galloped super,” O’Brien said. Despite a high class field heading to the barriers, O’Brien said he was not put off running De Little Engine in the $300,000 Group 3 race. “There’s obviously some good depth. When you have a full field of 17 runners it’s always going to be a tough race.